Slate is a beautiful natural material which is smooth but not highly polished, helping to show the grains and markings in the material. Because the slate is a natural material each bit of stone that is cut is truly unique and different. If you prefer a more uniform look then please click here which will take you to our slate corian signs, an option you may prefer. Our standard sizes make it much easier for you to pick the sign, choose the size, font and letter colour. Some of colours even include farrow and ball colours, click here to see our standard colours. 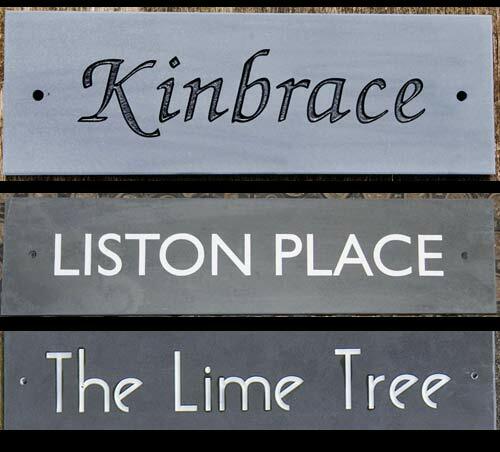 Our designers will create the perfect sign for you and your home. We can include a standard image @ £7.50 but suggested number of letters will need to be reduced.